Plastic Watering Can c/w Rose ..
A bright galvanised finish, this watering can is complete with a brass rose and perfect complimen..
Watering Can Rose Replacement rose for either the 2 or 3 gallon galvanised watering can Screw..
Hozelock sprayer provides easy, accurate and cost effective application nof water, insecticides, .. 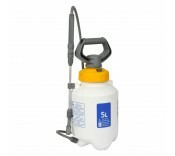 Comfortable, contoured backpack sprayer with harness and strong, integrated carry handle. Large..